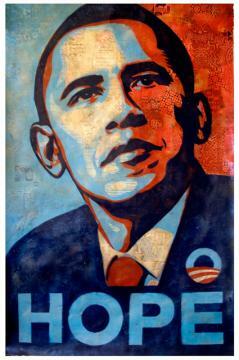 The lawsuits between Shepard Fairey (creator of the iconic tricolor Obama "Hope" poster) and the Associated Press have an interesting legal wrinkle that is worth examining: AP claims that Fairey violated the Digital Millennium Copyright Act (DMCA) in the creation of the famous poster. The AP counter-sued Fairey for violation of Section 1202 of the DMCA, which prohibits the removal of copyright management information ("CMI") from copyrighted works or the distribution of works whose CMI has been removed. The DMCA question has received little attention compared to whether Fairey's use of the photograph by AP photographer Manny Garcia is a fair use under copyright law (or even whether Fairey took any creative expression in the first place). What's the CMI that Fairey is accused of "stripping" from the original photo? Well, the AP complaint is not entirely clear on this question. In one part of the complaint, AP alleges that all of its digital photos include digital metadata that Fairey allegedly "stripped" from the image. In another part of the complaint, AP seems to rely on Fairey failing to preserve the "copyright notice line" at the edge of the photo. Now, suddenly, it seems like the process by which Fairey created the poster, at least digital versions of the poster image, might actually matter. If it was created by hand, then that wouldn’t have involved “removal” or “alteration” of the CMI embedded in the original JPEG file. But if it was copied and edited, then it may have. AP would still need to prove that the removal was intentional, though, and here’s a question I don’t know the answer to: what happens to all that metadata if you copy a photo, edit it in Photoshop, and then use the “Save As…” command? The answer to Prof. Boyden's second question is that a file edited and re-saved in Photoshop generally will retain its metadata. As for the first question, it appears to be be answered by this video from Time magazine, in which Fairey demonstrates his process — clearly not a digital transformation of a digital file. As he shows in the video at around 2:15, he creates his images by cutting away sheets of transparent film placed over the photo with a razor, and after scanning those films, applies color in Photoshop. And in this NPR interview, he describes the Hope poster as "a hand-illustrated image that I also did some digital tweaks to before I started illustrating it." If that's right, then the AP would have to argue that the physical act of cropping the photo (thus eliminating the AP copyright notice line), violates the DMCA. That could be an uphill fight for AP, at least in light of a case rejecting a similar claim for a fabric design that included a copyright notice on the garment hang tag and fabric selvage. So why did AP bother to add a DMCA claim to what seems to be a straight copyright dispute? Consider this: under the DMCA, the prevailing party is entitled to statutory damages between $2500 and $25000 "per violation." How do you count up "violations"? The statute doesn't tell us. But although there are very few cases that have addressed this question, some suggest (wrongly, in my view) that you tally statutory damages based on the number of copies distributed — which in Fairey's case is at least 300,000 (more if one includes the millions of bootleg copies). This is very different from statutory damages in copyright, which are tallied based on the number of works infringed (in Fairey's case, 1). So this may give AP a big statutory damages hammer that copyright law doesn't give them. In any event, there is no liability under DMCA Section 1202 unless the CMI was removed for the purpose of inducing, enabling, or facilitating copyright infringement. So if Fairey wins the copyright infringement issue (either on the basis of fair use or because he didn't appropriate any protectible expression owned by AP or Garcia), he should also beat AP's DMCA claim. But it's hard not to conclude that the DMCA claim is in there to intimidate Fairey by making him fear a larger damages award if AP wins, an award that has no relationship to any "harm" that Fairey allegedly caused to AP. In short, this is yet another way that the DMCA chills fair use, by potentially turning a small statutory damages award (for infringing one work) into a big statutory damages award (for distributing many copies of your inspired, transformative poster).